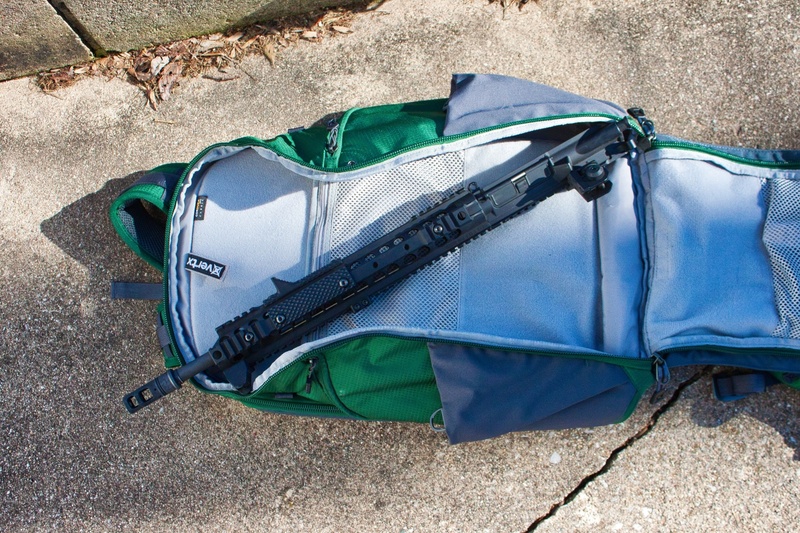 Any dedicated carry bag will be a slightly less covert method of transporting a rifle simply due to the advertising around its intended purpose. 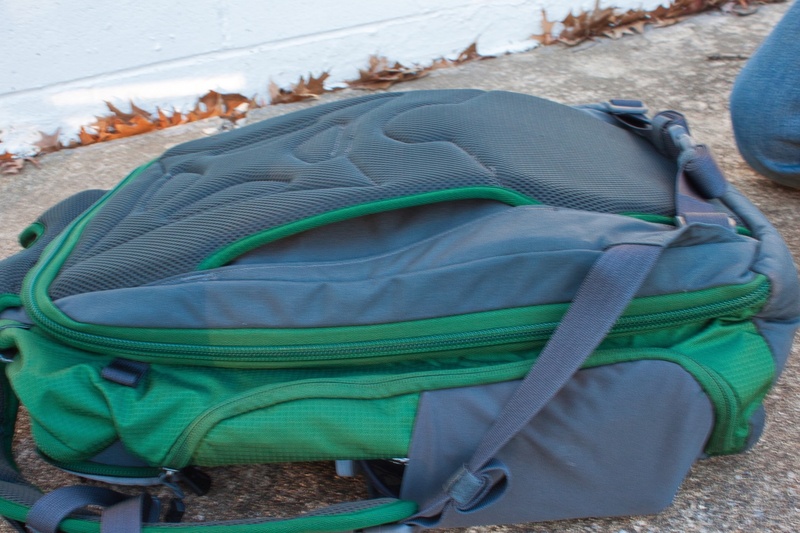 However, the VERTX EDC Gamut Plus does not overtly market the backpack as a rifle bag and does an excellent job of staying low profile while offering a feature-rich backpack. 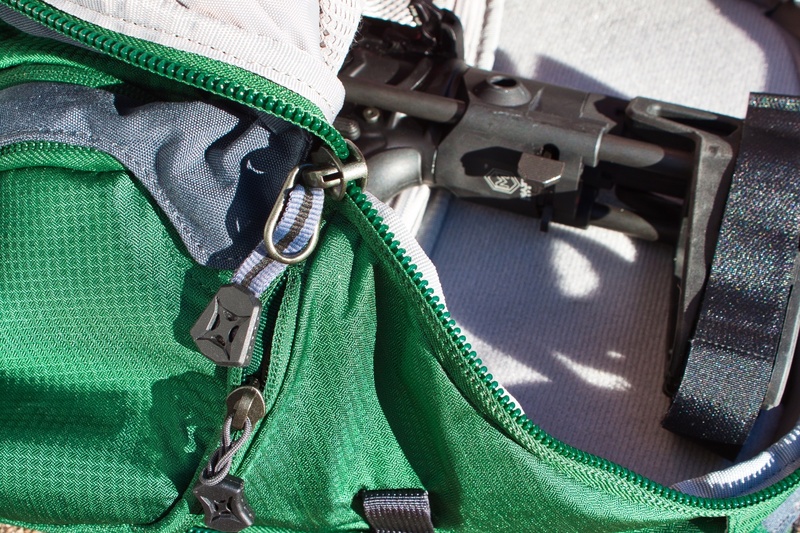 When transporting firearms to the range, this bag can allow for easy transport without catching the eyes of your neighbors. The great feature of this pack is the ability for it to quickly adapt and transition between covert and overt while truly filling both rolls. The EDC Gamut Plus comes in Greener Pastures, Smoke Grey, and Black and retails for $219.95. The bag appears very durable, constructed of 220/310 Cordura material, and uses YKK zippers. I purchased the bag for a low profile means of transporting SBRs and pistol AR’s. The dimensions are 24”x16”x9”. 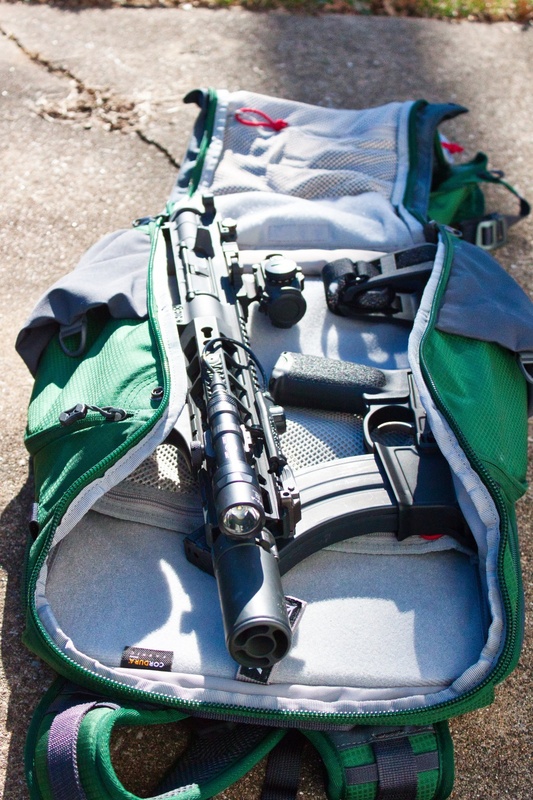 The 24” dimension is very important as many bags do not offer this great of a height and therefore significantly limit your options for carrying a rifle. After testing I found that up to a 14.5” upper would fit inside the bag when broken down. While a 16″ upper was a little too long, a 14.5″ upper with a short muzzle device would most likely fit. 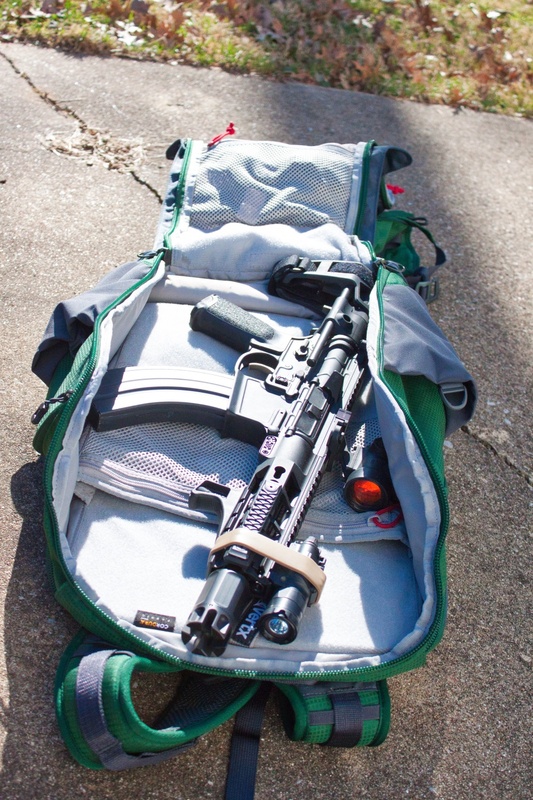 The bag held an assembled PWS Mk107 with a 7.75” barrel. This did require the use of a Maxim PDW brace as that shortened overall length by 1.545”. A PWS MK111 with an MK107 upper can fit fully assembled in the pack. The MK111 pistol with the 11.85″ barrel will fit well when broken down. This brought total overall length to just under 22.75”. 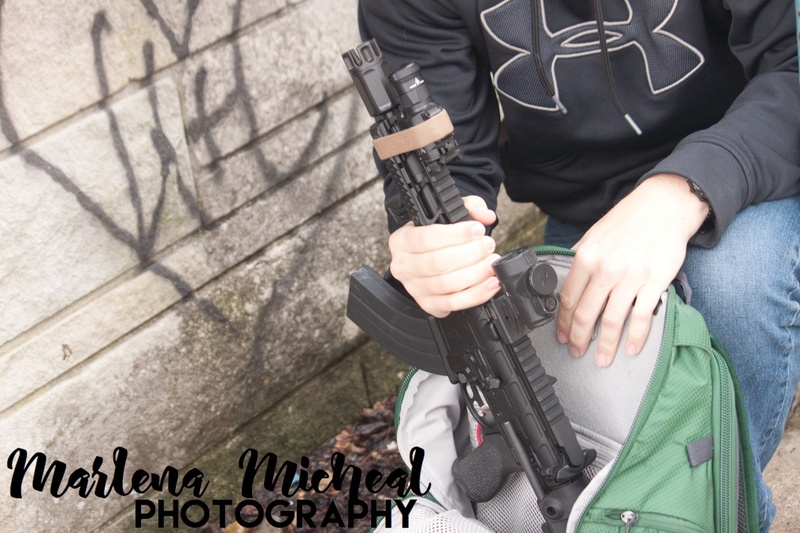 While I do not have a LAW Tactical folder to test folding AR’s, a 10” AK with a folding stock fit well with approximately 1.5” to spare when in the bag at an angle. This 1.5” should make up for the length added by a LAW Tactical folder. 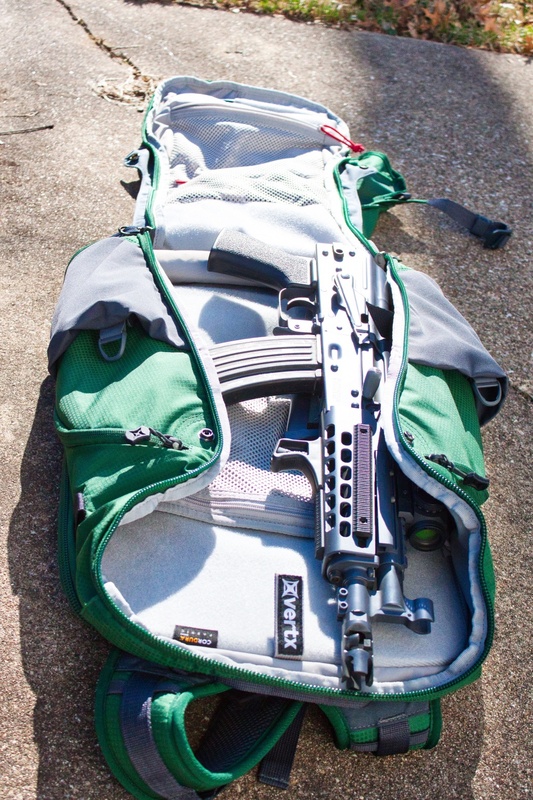 A side folding AK with a 10″ barrel fits well in the bag with room to spare. All measurements above pertain to the large main pocket in the bag. The main compartment also has a zipper stop on both sides to allow for added privacy when searching through the main compartment. These can also be readily unsnapped to access content in a timely fashion. 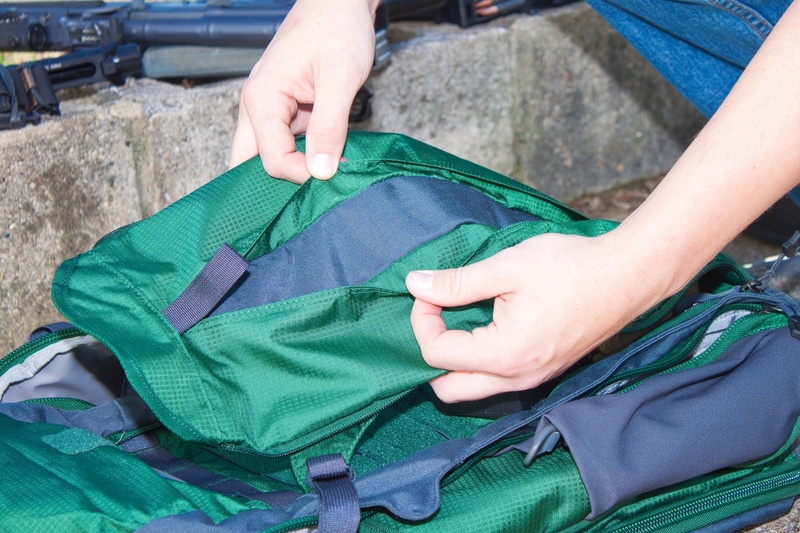 Zipper stops offer the ability to only open the top of the bag for added privacy. Mesh pockets and micro Velcro line the interior of the largest compartment. 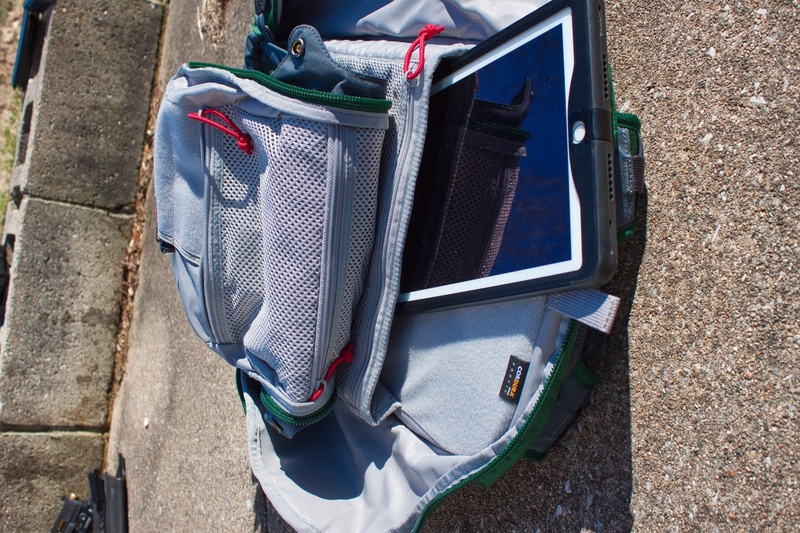 The mesh pockets are divided by zippers and offer great storage options for medical gear, extra magazines, laptop chargers, etc. 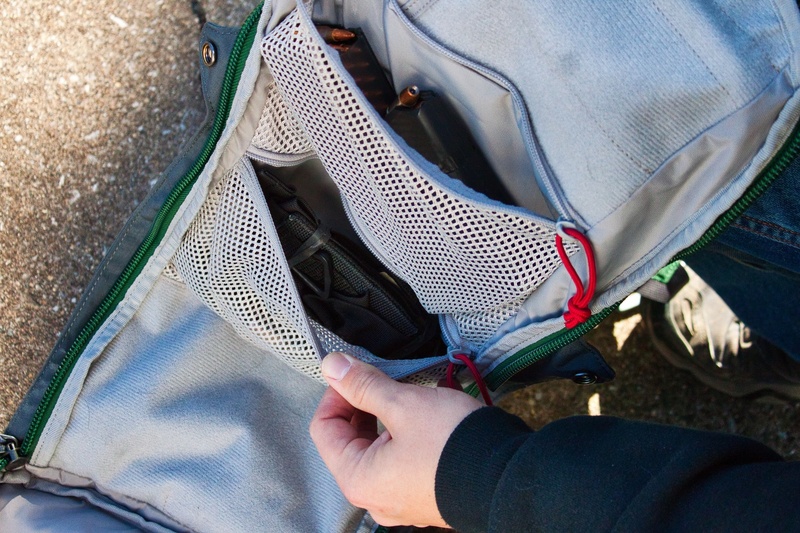 The mesh pockets provide organized compartments for smaller gear. 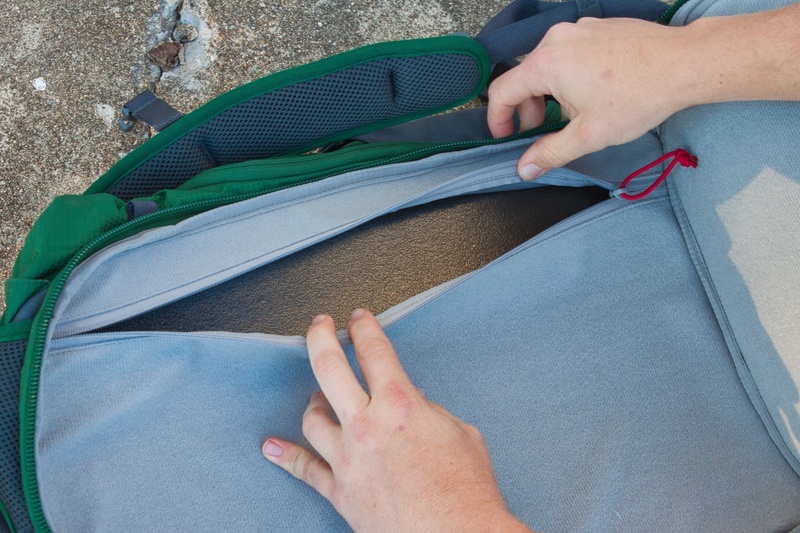 There is also a well-padded laptop compartment that was designed to fit up to a 17” laptop. I have used this pocket primarily for extra rifle magazines and it has worked well. 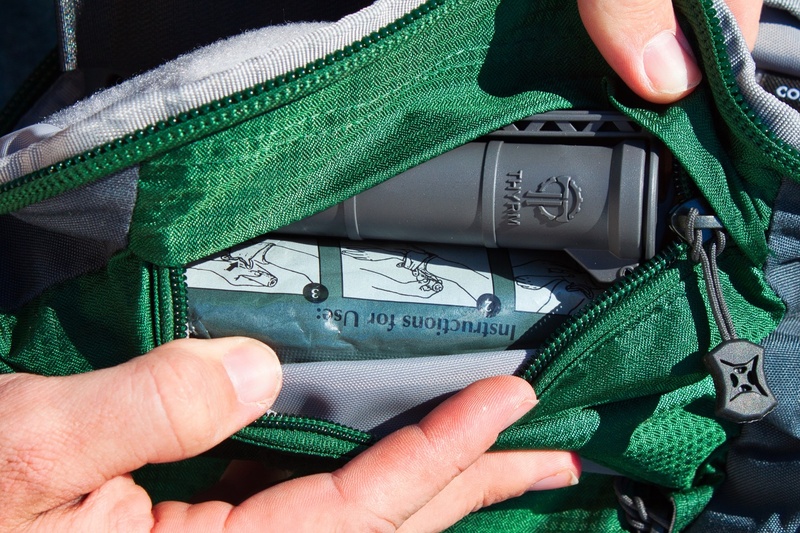 Inside the pocket is more micro Velcro that can be used in conjunction with other Vertx accessories for better organization and retention. The laptop compartment is well padded to protect your electronics. The quick access pocket in the back of the bag is a cool concept but difficult to match with a larger weapon system. 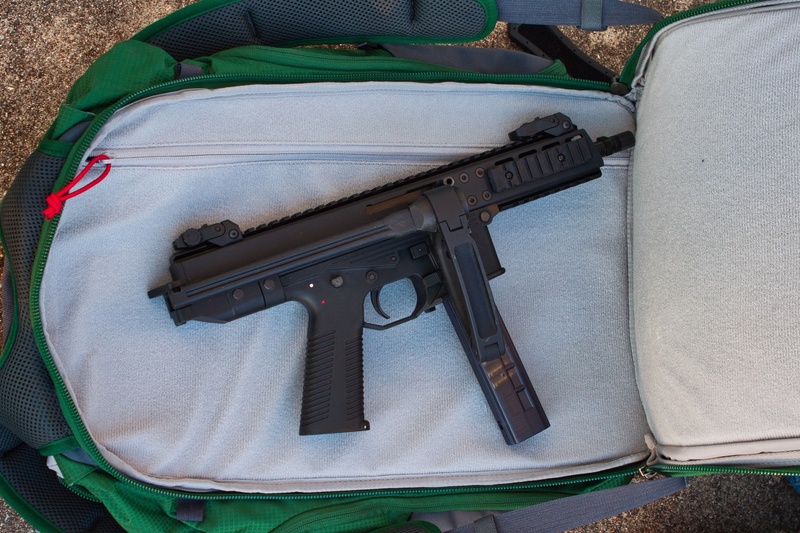 A standard pistol would work well in this compartment, however, a stabilized pistol often is too long or too wide if using a folder. 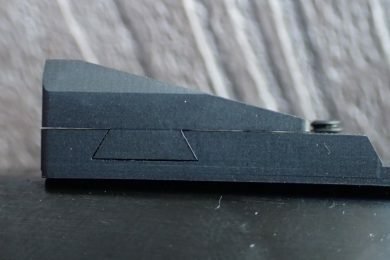 This pocket would be excellent for a small sub gun styled firearm, but it definitely works better for collapsible stocks and braces due to their thinner profile. Notice the bulge in the back of the pack due to the thickness of the brace. A folder does work, but is uncomfortable on the back and pushes out the pocket in a way that the pocket was obviously not designed. There is a zipper that allows access to the backing panel. This zipper could allow the user to add a ballistic plate. This panel adds structure and stability to the bag but can be removed and replaced with a ballistic plate for added protection. There are also two water bottle pockets on both sides. Inside the pockets is a cinch cord to retain the bottles by placing the elastic cord around the bottle. These were designed for 27oz (to 32oz) Nalgene bottles can be stowed but are difficult task to fit. Notice the retention lanyard around the bottle. 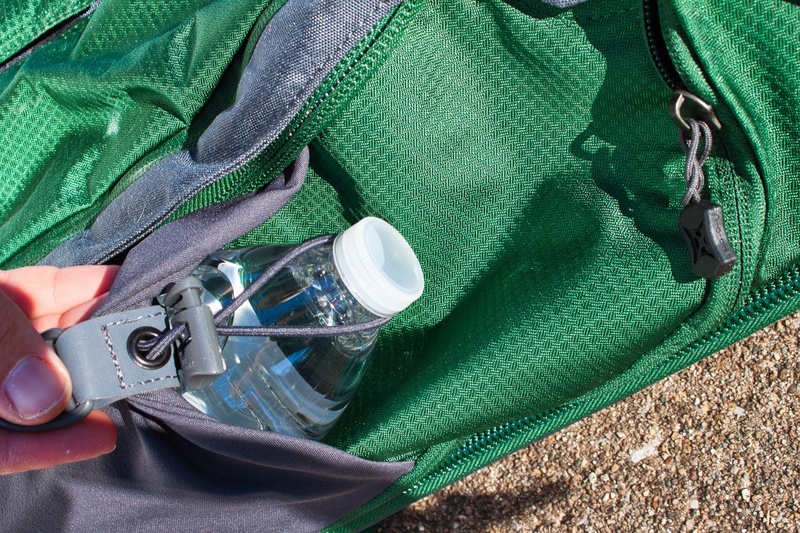 Side pockets are also available beneath the water bottle compartments on each side. These work well for cell phones, pens, wallets, and other flat items. More pockets to organize small, flat items. On top of the bag is a zippered pocket Vertx refers to as an admin pouch. This pouch is a nylon pouch without padding and is great for carrying small items you need to have in a convenient location without searching deeper into the backpack. I like to keep an extra set of Surefire Sonic Defender earplugs, sunglasses, compression bandages, or a cell phone charger. It also includes a small lanyard with a clip to attach keys, identification, etc. 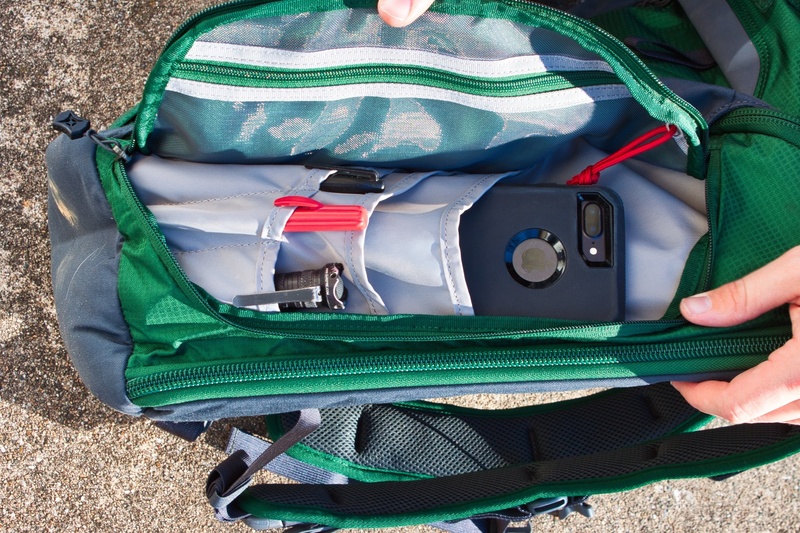 This pocket offers quick access to a few small items on top of the bag. 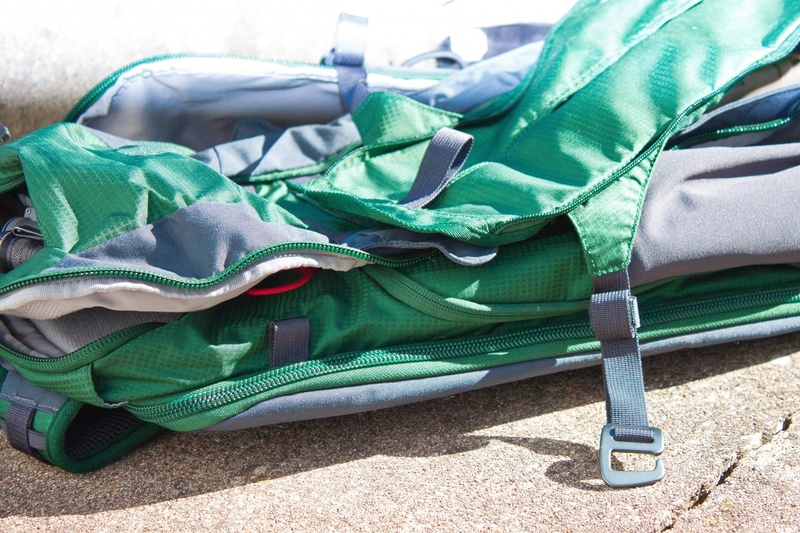 A key component of any backpack system is the shoulder straps. The shoulder straps on the Gamut Plus are well padded, with 1919 straps that run along the shoulder straps and allow for attachment of added tools or pouches if needed. There is a removable sternum strap included. Keepers are also included at the bottom to manage the excess straps at the bottom of the bag once the straps have been fit to the user. 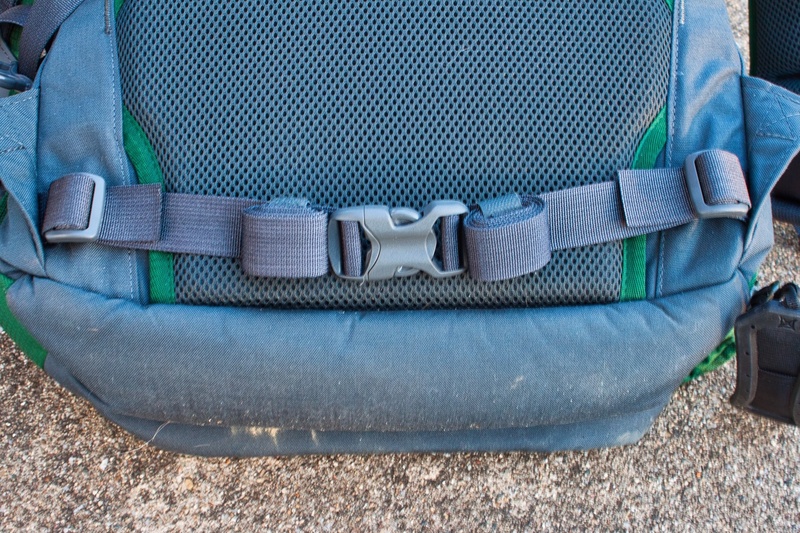 A waist strap is attached for those wanting added stability. 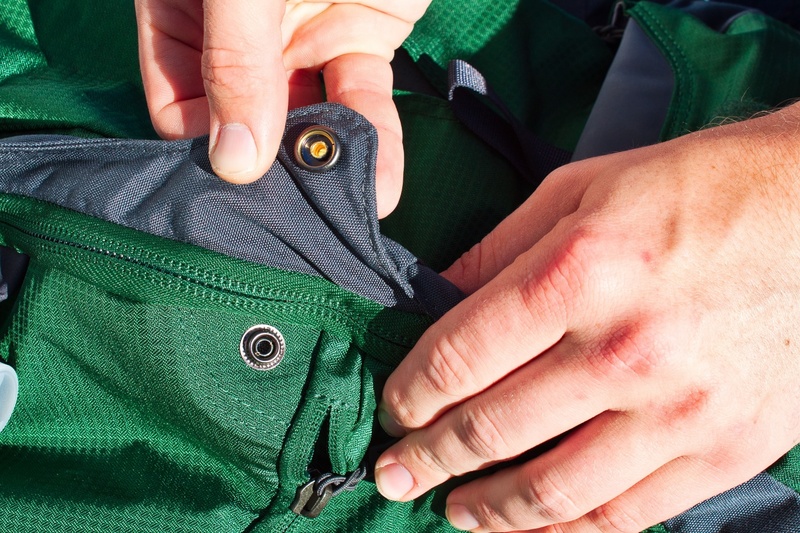 An incredible design feature of the Gamut Plus is the outermost pocket. 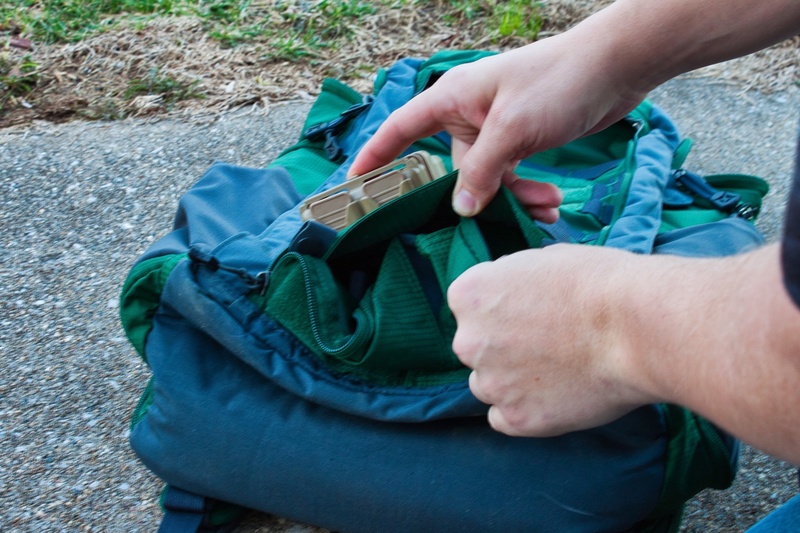 The outmost pocket can be unzipped and the shell of the pocket can be stuffed into the bottom stow area. 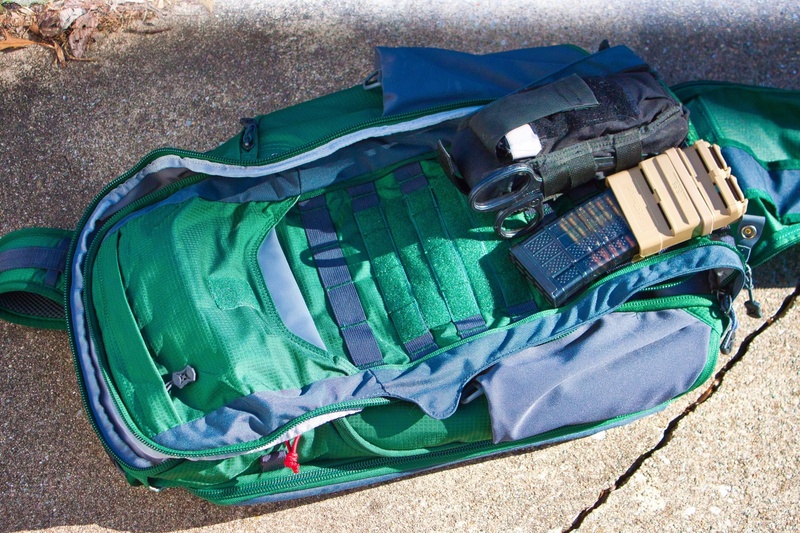 This allows for an overt package with quick access to gear attached to the molle and provides identification patches to be attached to the Velcro. Open the Velcro at the bottom of the bag. Push the shell into the pocket. Velcro shut the bottom and you have an overt exterior that is convertible in seconds. 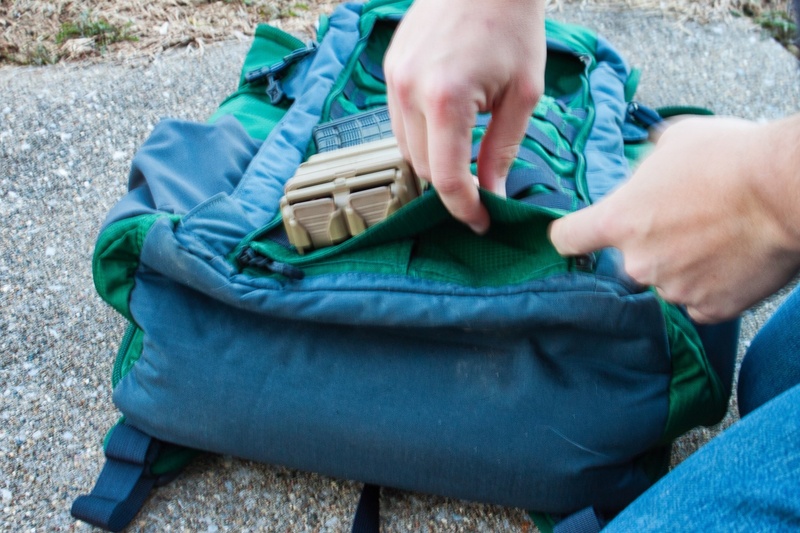 A medkit or magazines could be attached to the MOLLE segments, but there are minor stability issues if the large pocket is not filled. A small Dark Angel IFAK and FASTMag are attached to the MOLLE. 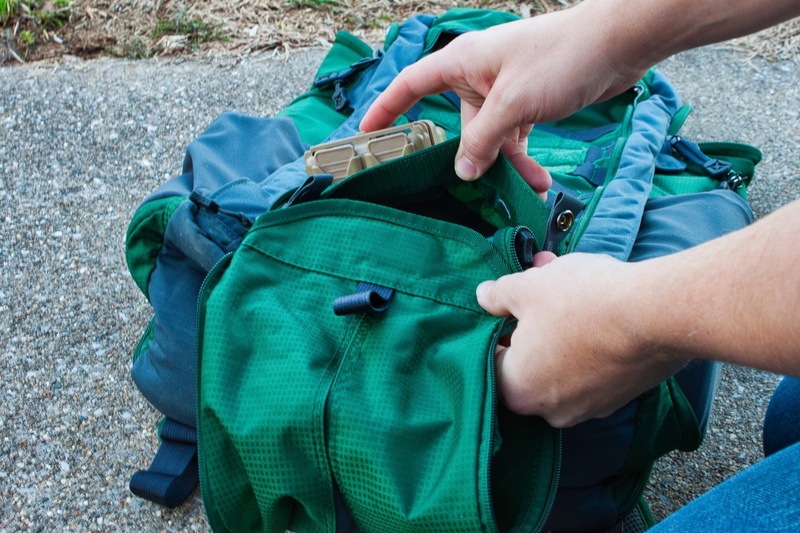 Since there is not a firm backer to the outermost pocket, the weight from the mag holders or other accessories can pull outward instead of remaining perfectly vertical. The “shell” also has G hooks that can be attached to the loops on the side of the pack. Notice the G-Hooks attached to the outer shell. Other large items can be then retained such as a ballistic or motorcycle helmet thanks to this sling load system. The outer shell is also able to somewhat expand in an accordion fashion while also compressing down to a small size when not in use. While many bags only do one job well or many things poorly, the VERTX EDC Gamut Plus seems to break the rule. 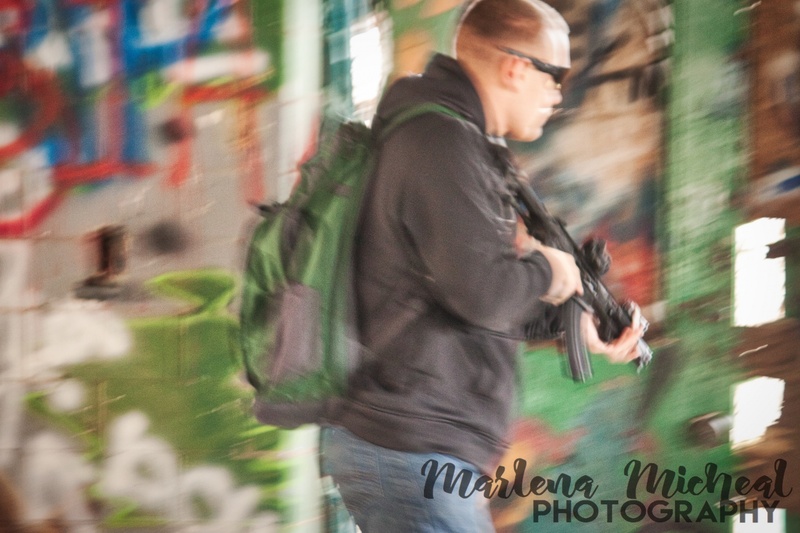 I experienced no durability issues, SBRs and stabilized pistols were retained well, and the only issue with the pockets is that you may lose gear due to the multitude of pockets! The outer appearance is definitely disguised well and could truthfully also be used for standard school or office activities as well. Next time you are looking for a backpack you should definitely check out theVERTX EDC Gamut PLUS. Having compensators on pistols is not exactly new. Competitors have been porting pistols for a very long time. Go look at any open division pistol in USPSA or IPSC. However, since the Roland Special came out, we have seen an increasing trend in compensators for Glocks. This has led to companies like Archon Mfg to make compensators. 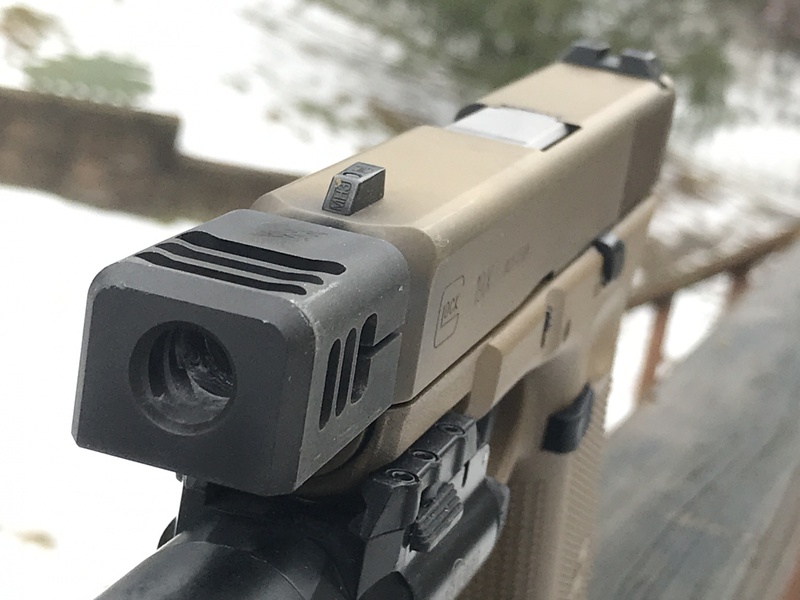 As a fan of compensated pistols, I got the opportunity to check out their Glock compensator. For those who have not had the pleasure of shooting a compensated pistol, You are missing out. 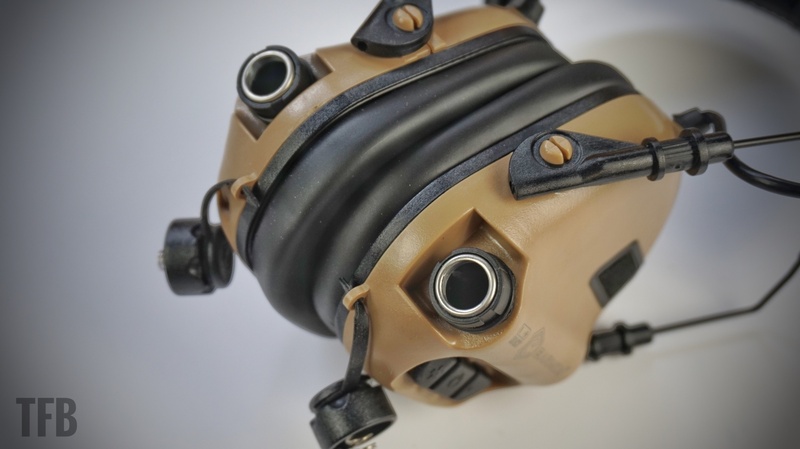 With a good comp design, the gasses help mitigate muzzle climb and recoil. 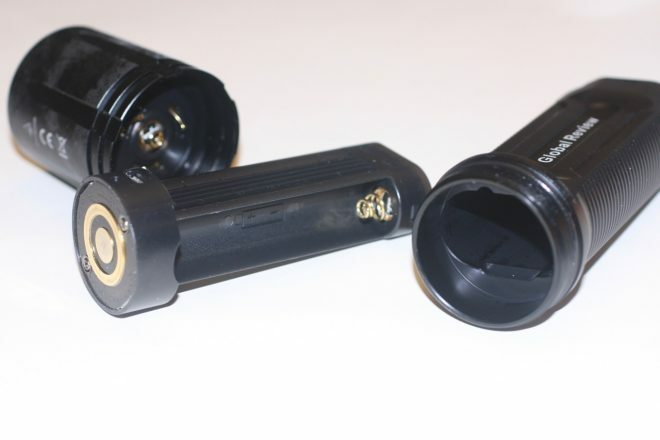 Archon Mfg’s take on their compensator is actually different than their competitors. 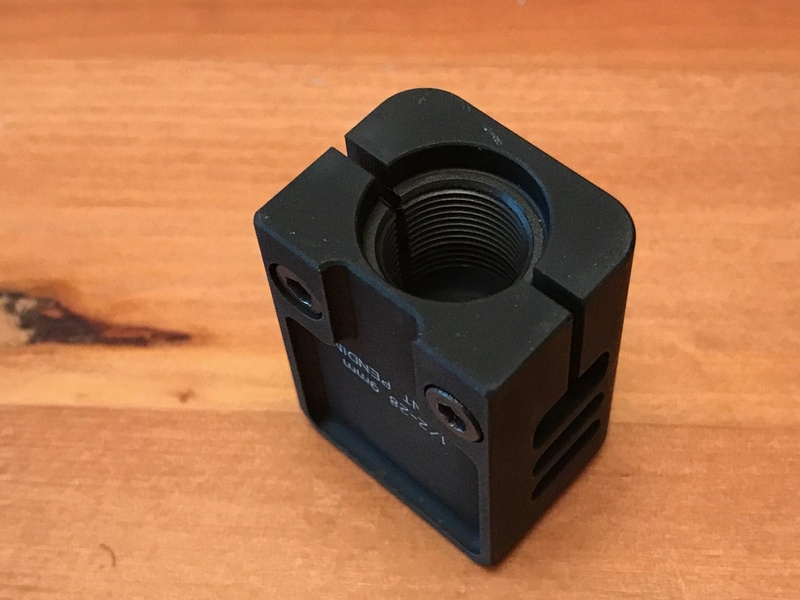 While many other comps do screw onto a threaded barrel, Archon’s comp does not require thread locker or set screws against the threaded barrel. Instead, they split the female threads and have two screws on either side. 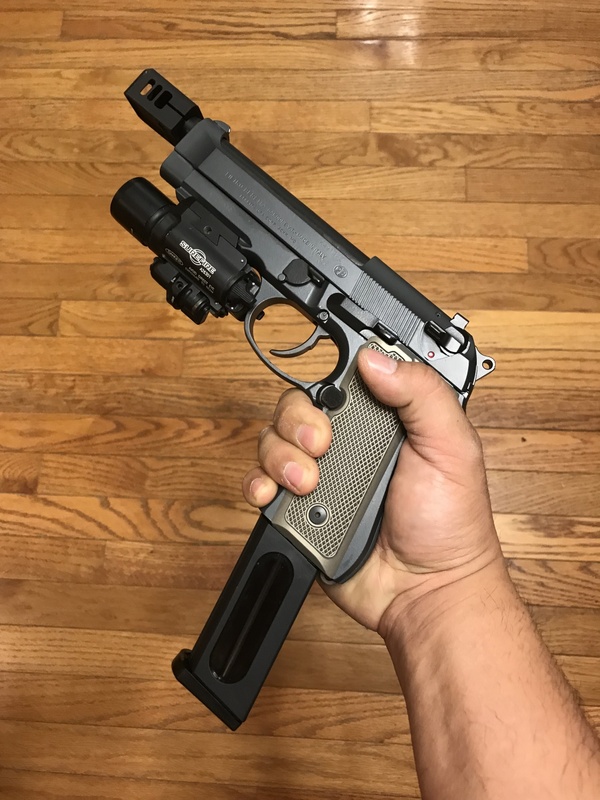 So all you need to do is screw the comp onto the barrel, then time it to the right position and tighten the two screws so the comp clamps onto the barrel. One added benefit to a comp on a Glock is that now your weapon lights don’t get coated in muzzle blast residue. Most of the gasses are going out the sides and top. Very little of it is blowing down to the light. One minor issue is what threaded barrel you use. I am using a Lone Wolf Gen5 Glock 19 threaded barrel. Some threaded barrels have different lengths. 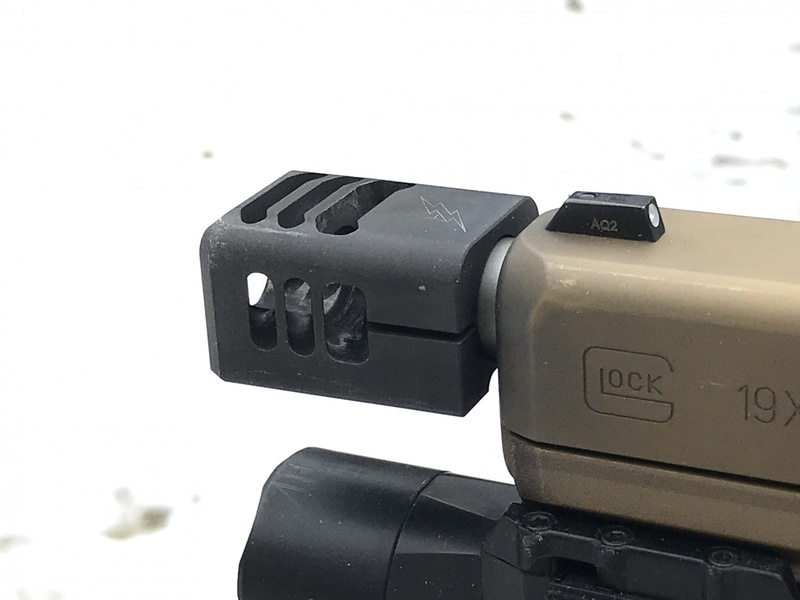 The gap between the Glock Comp and your slide will vary due to variations in barrel length on aftermarket barrels. This is as close as I could get the Archon comp onto the G19X with the LW barrel. Notice there is a gap and the rounded corners of the Gen 5 disrupt the look. 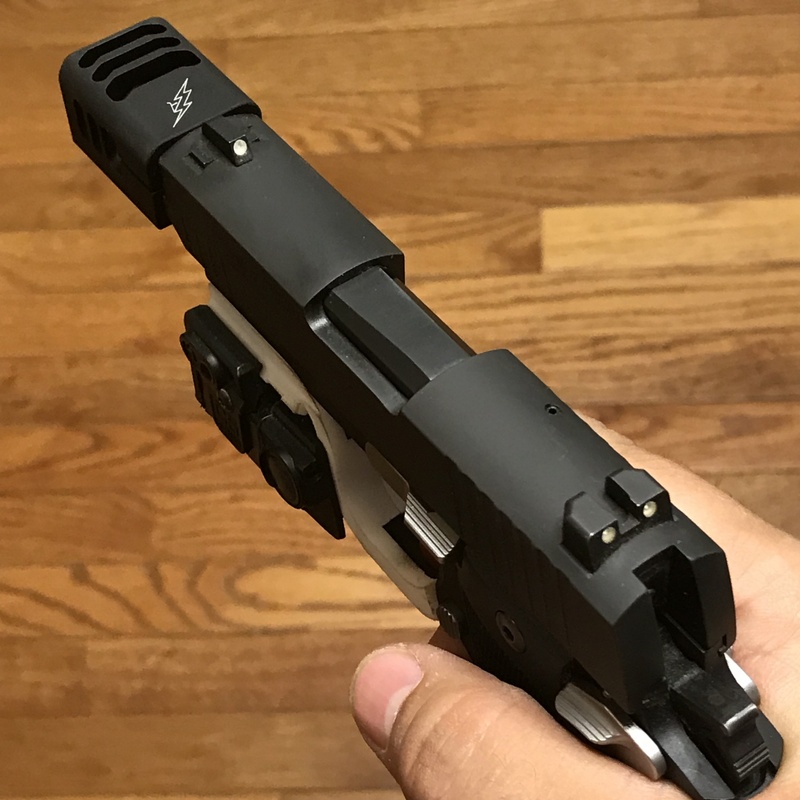 If I used a Gen4 or lower Gen Glock, the aesthetics where the slide meets the comp would look better. While their compensator was designed for the Glock pistol, it is not limited to just the Glocks. 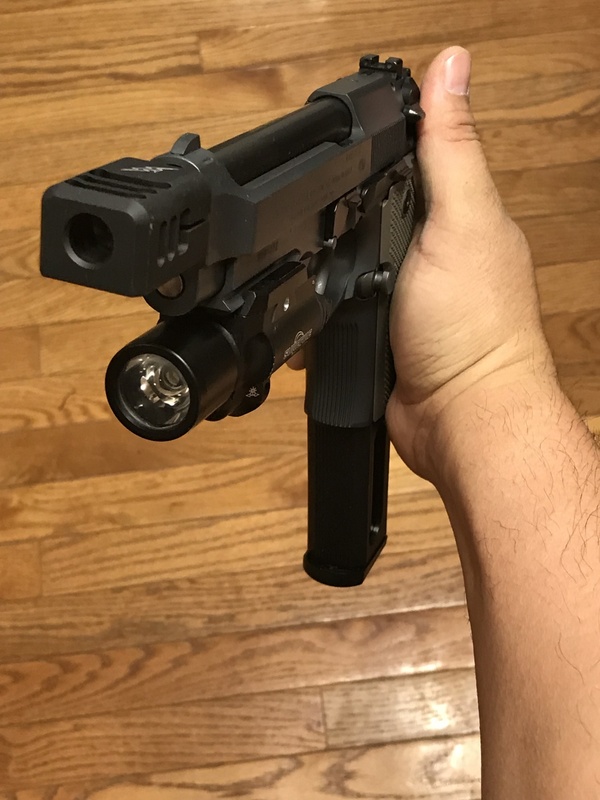 You can mount this compensator onto any pistol with a threaded barrel. Does It Actually Do Anything? So I am a bit spoiled as my benchmark for compensated pistols is my STI Steel Master race gun. It is the flattest and softest shooting 9mm handgun I own or have ever shot. So how does the Archon Mfg compensator compare? It is not in the same league. Is the disparity just from the compensator design? I don’t think so. The STI Steel Master is a purpose-built race gun. It was designed to run compensated. 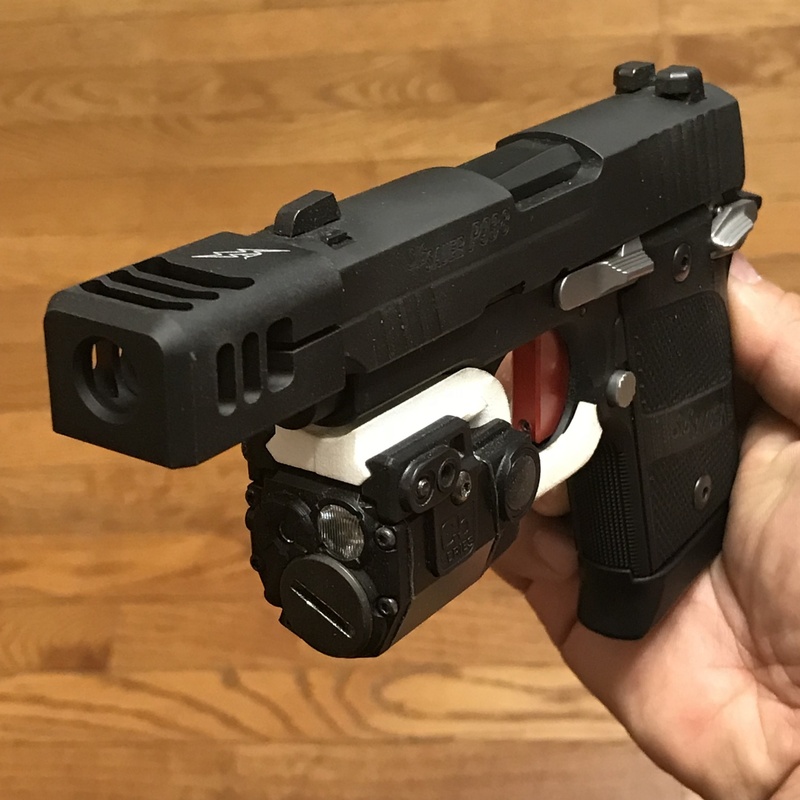 Adding a compensator to a pistol does not mean it is a race gun now. Just like adding a spoiler to a car does not make it a race car. So does the Archon comp work? Yes. There is an appreciable difference with the comp than without. Take a look at the video below. It is a side by side comparison of the Glock 19X with and without the compensator. The left side has the Archon comp and the right side does not. Both shots you can see there is still muzzle climb. However, pay close attention to the position of the 19X after the recoil. The gun is physically higher and I have to bring the gun back down on target. With the compensator, the 19X does not jump as high and is quicker to bring back on target for the next shot. 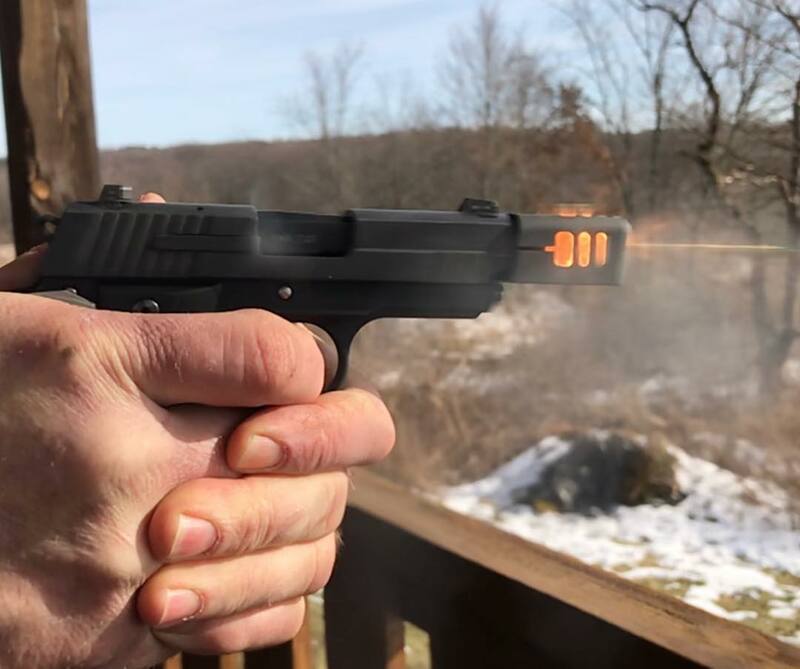 The difference is very noticeable on smaller guns like my Sig P938. I think it is because the barrel is so much shorter and there are more gasses to make the comp work better. Just like a spoiler, you need more air/gas for them to be effective. 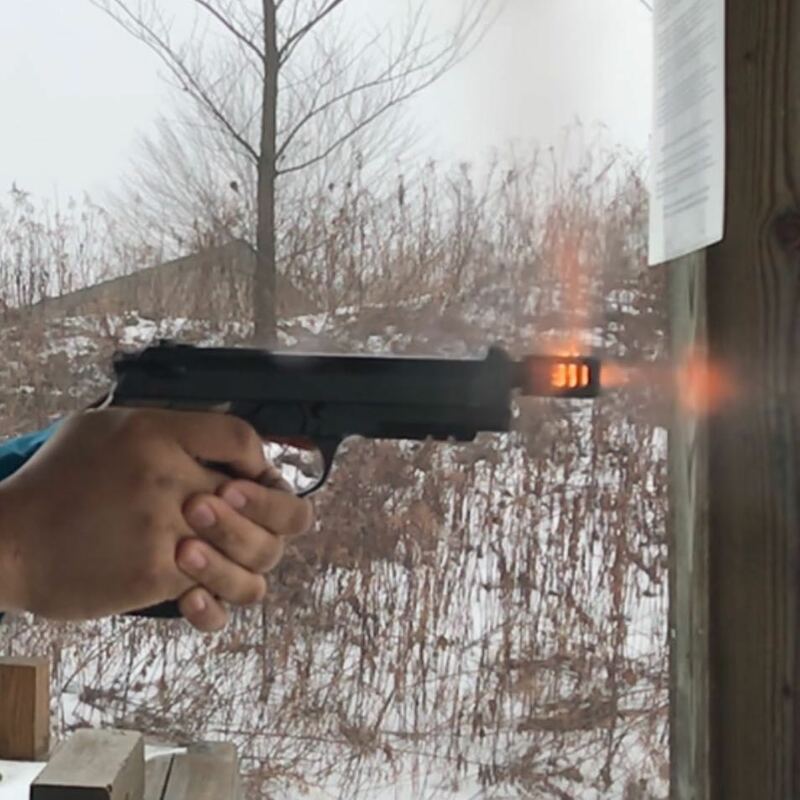 In open division pistols, shooters typically load hotter rounds just so there is more gas to act on their compensators. No, it is not. But it is pretty good. The best part is their split design. It was very easy to swap between guns and since there is no set screw, the threaded barrels are not messed up. The overall length of the Archon compensator is a bit long. 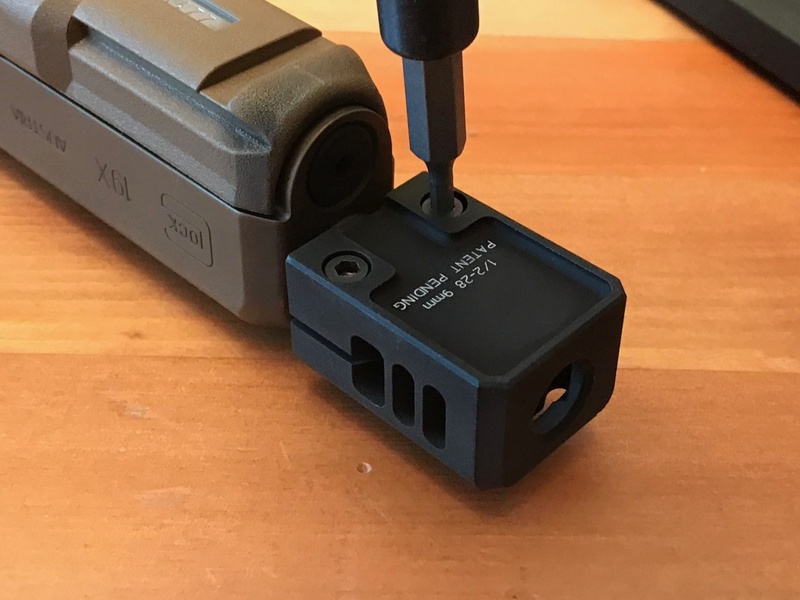 Mounting it onto a Glock 19 gives the overall length similar to a Glock 34. I would have preferred a Glock 17 profile as holsters would be easier to find. 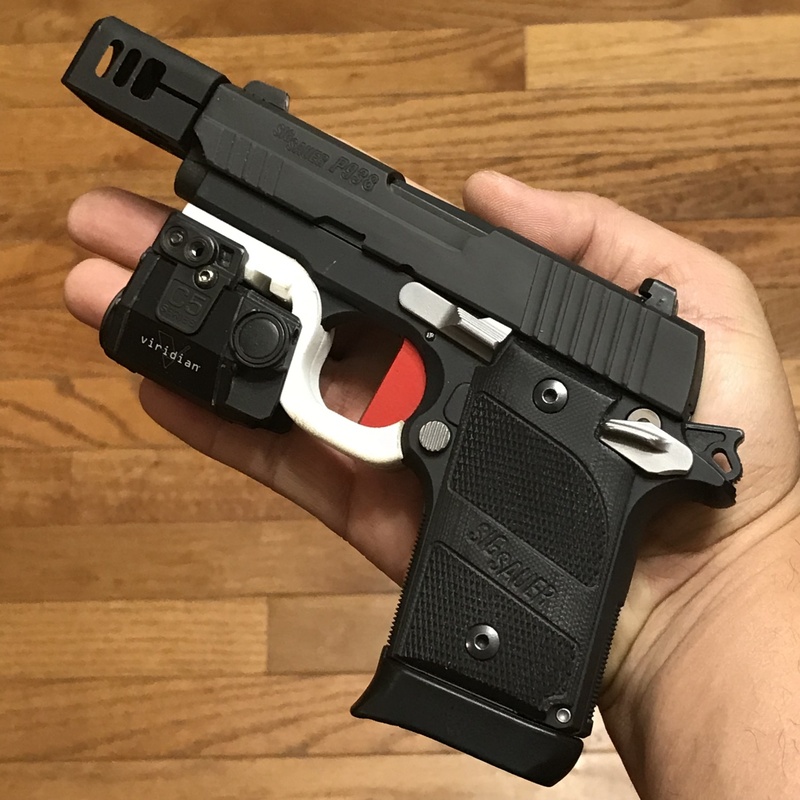 Luckily I have my holster for my Glock 35 and this fits perfectly. One idea I had would be to alter their design so that the compensator does not need a threaded barrel. They could get a batch of long barrels and mill a slot on either side. Similar to the KAC Hush Puppy Beretta barrel. Reposition the set screws to line up with those slots and now you have a compensator/barrel set up for states that ban threaded barrels on handguns. The Archon Mfg Glock compensator is quite affordable at just $69.99. Check out their website for more info. Fenix is not a new kid on the block. Arguably Fenix is one of the original Asian light companies, and rather than trotting out the “flashlight de jour” based on another generic Chinese design, Fenix comes up with their own (mostly) original designs. So when Fenix offered an open opportunity to be a global reviewer of their TK35 2018 Ultimate Edition, my interest was piqued and I applied to be a reviewer. I was fortunate enough to be chosen and a “Global Review” sample came my way from the factory. The light arrived in Fenix now-familiar orange and gray box. Included with the light is a nylon holster, micro-USB charging cable, and the owner’s manual. 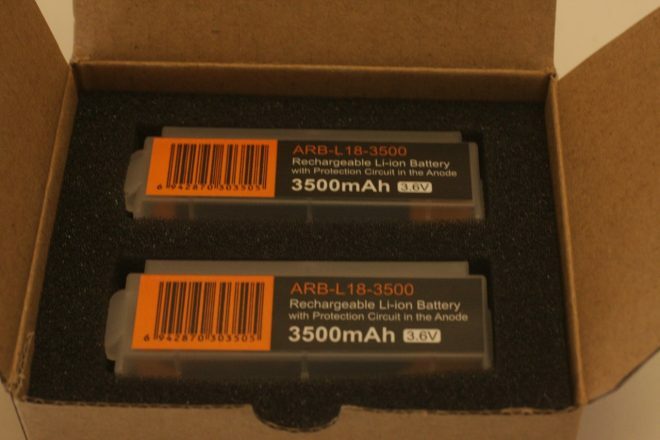 Fenix also supplied 2 of their ARB-L18-3500mAh 18650 cells. The light has a design that is familiar to most Fenix devotees…a flat body couple to a round head via a smooth thread. Inside the flat body is a battery carrier that holds the 2 18650 cells side-by-side. 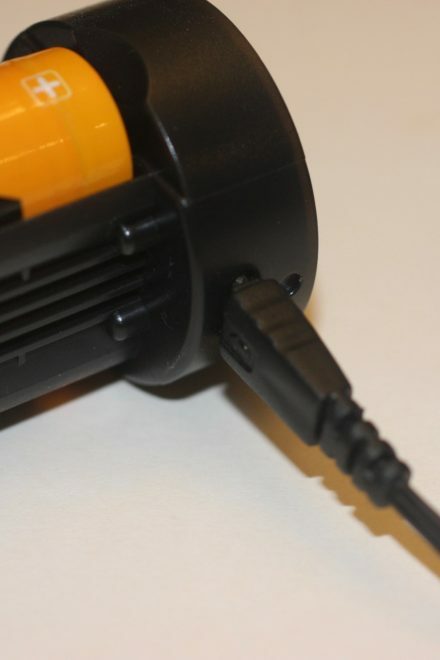 Also on the carrier is a micro-USB receptacle that allows the user to utilize the carrier as a charger. I tried the charger once and it did fine, although I prefer to use one of my better (faster) chargers. The operation is via 2 switches on the tail of the light. 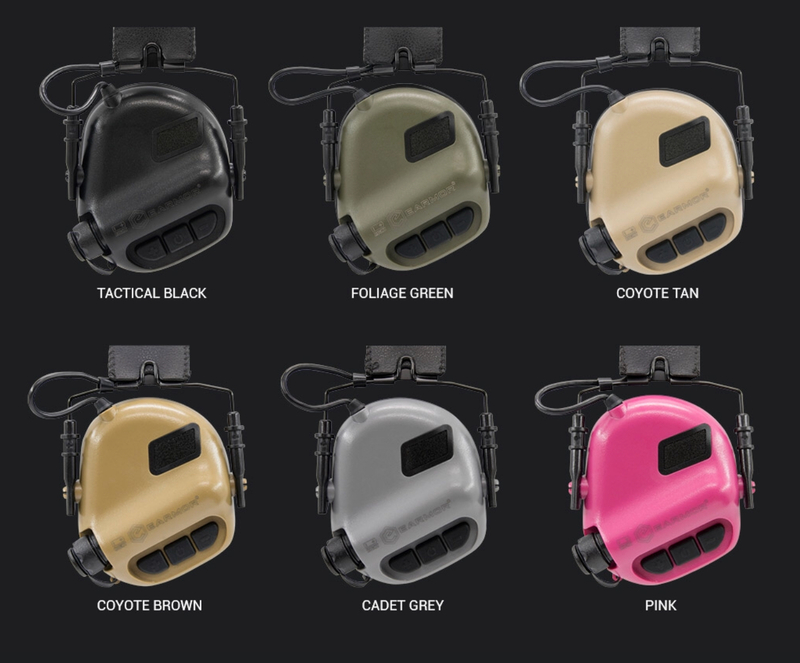 The “mode” switch is multi-functional – you rotate from “lockout”, to “Outdoor”, to “Tactical”. You also depress this button to cycle through the modes when in outdoor, or activate strobe or beacon in tactical or outdoor mode. The other button, a more traditional click switch, provides either momentary on/off or lock on. The following is a video walkthrough of the features. As indicated in the video, I have really come to appreciate this interface. Easy to learn, intuitive and useful. I measured the output of the light on the highest setting with the 2 freshly charged Fenix cells and my sphere indicated 3056 lumens at turn on. 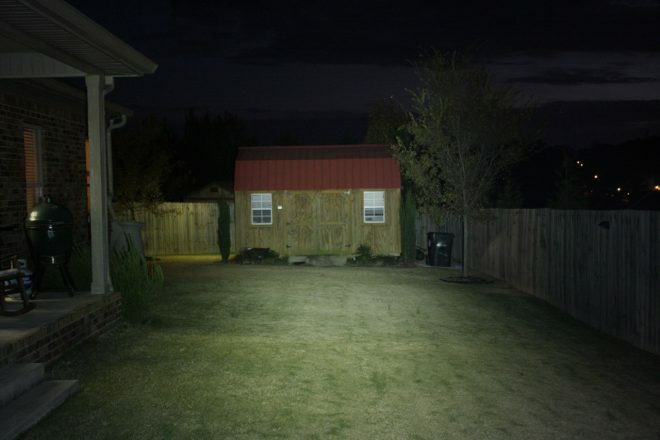 Not quite as high as Fenix’ claim, but most manufacturers quote LED lumen and I measure out the front. Regardless, very impressive. Most forget in this never-ending quest for output, that the human eye needs approximately TWICE the output to easily notice the difference. On “turbo” you can see the difference. 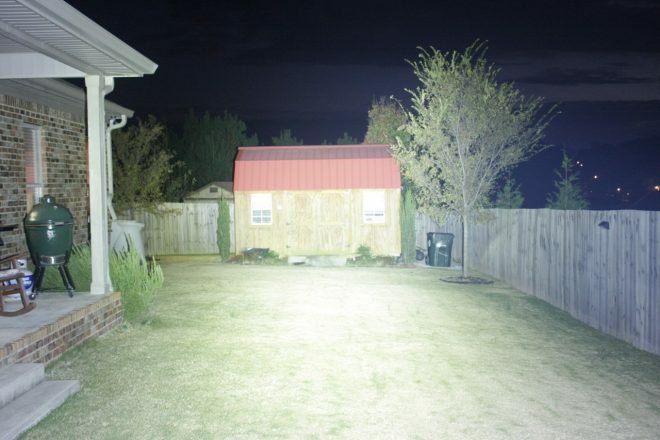 The following photos are “beam shots” taken at night. I used my Canon EOS 40D with a Sigma 18-50mm 1:2.84.5 lens. The shutter is locked at 1/4 second…ISO at 1600 equivalent…color temp set manually to 5000k (except for the daylight shot). 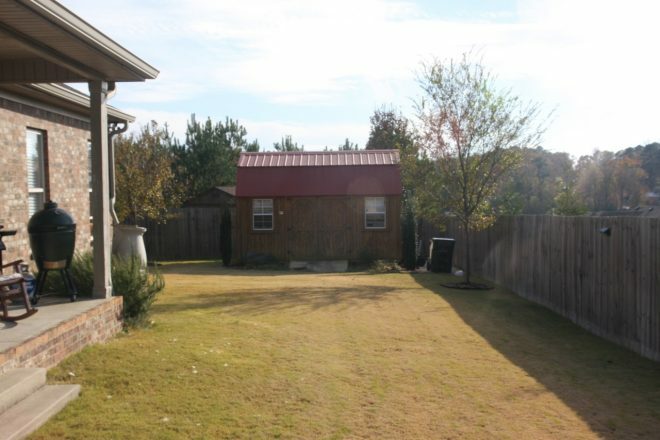 The first shot is the daylight shot of the storage building that is my ‘target.’ It was a slightly overcast day. First up is the venerable old Surefire G2 Nitrolon. 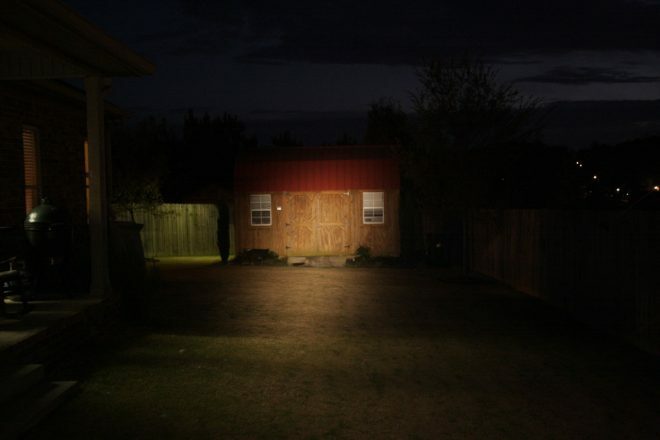 This is an old-style incandescent that puts out around 60 lumens. This thing is insane on the highest level. 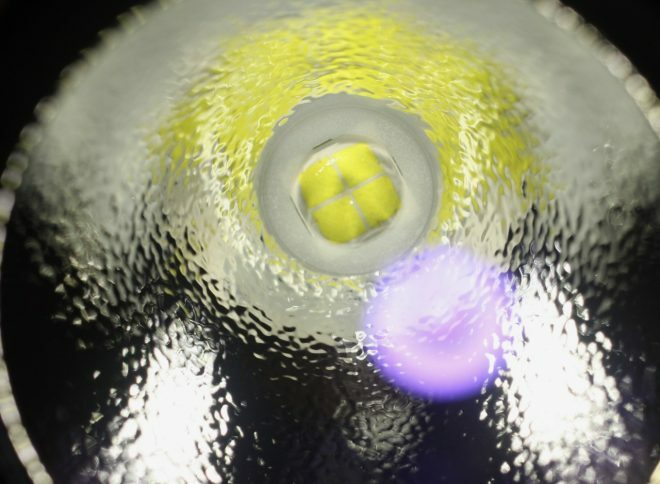 Yes, there are MANY lights out there claiming 3000+ lumens output, and I’m not stating that this one is better than all the competitors. 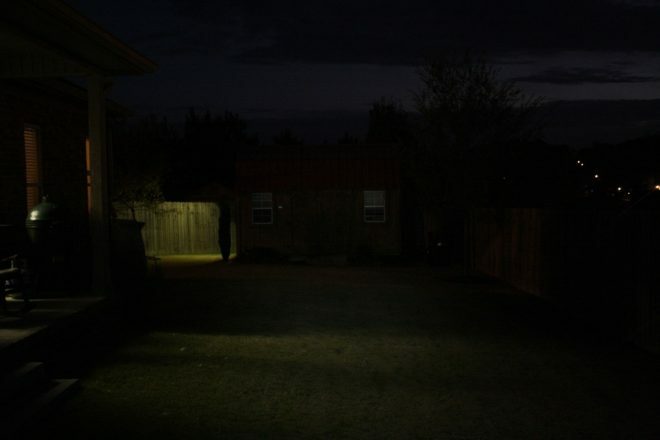 It’s just that, for my eyes, the beam quality, tint, and output of this light are VERY useful for one who might need a handheld searchlight. 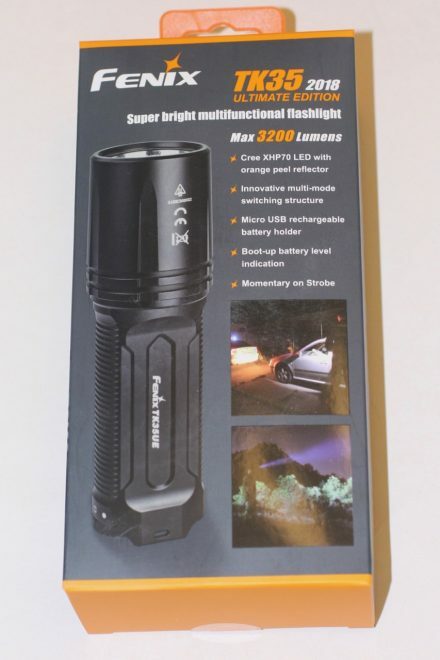 In addition, the ease of switching from any level to the 2000 lumen output by simply moving the mode switch guarantees quick, bright light without a lot of fiddling. Run times range from 152 hours on eco to 1 hour and 30 minutes on the highest level. I did not test the run times, but based on the level of discharge after some of my real-world use, it seems reasonable to expect 2 quality 3500mAh batteries to run close to that amount of time. Verdict? 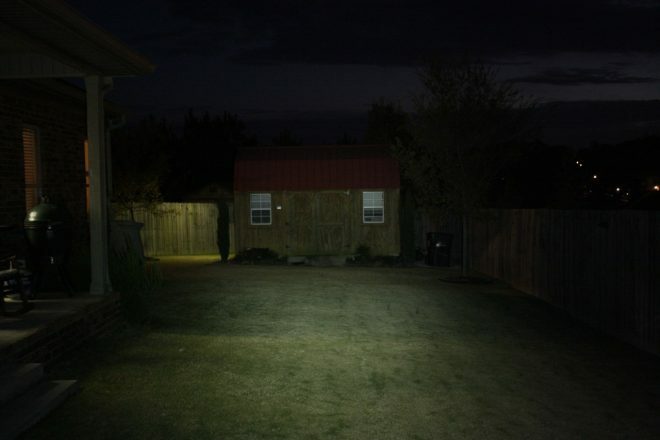 This is an awesome light. I favor lights that I can pocket carry, but this is a great light to have in your stable if you need a powerful searchlight/tactical light. The light is currently available for $129. You can show TFB some love by checking it out on Brownells! While I do like using iron sights on this particular rifle, I admit: The original buckhorn sights aren’t awesome. They’ve worked alright for hunting wild boar at close ranges, but shots past 100 yards get tricky. I worked up a table for my 3 primary hunting loads on this rifle as to where their point of impact is at what range on what rear sight elevation setting. Despite this, I don’t ever want to be fumbling with the rear sight elevator during a hunt. Back when I was testing out their new extractor claw, Ranger Point Precision was also nice enough to send me one of their front and rear sight assemblies to try out. The RPP rear sight assembly is adjustable for windage and elevation. (MSRP: $72.00 for front and rear sight assembly). 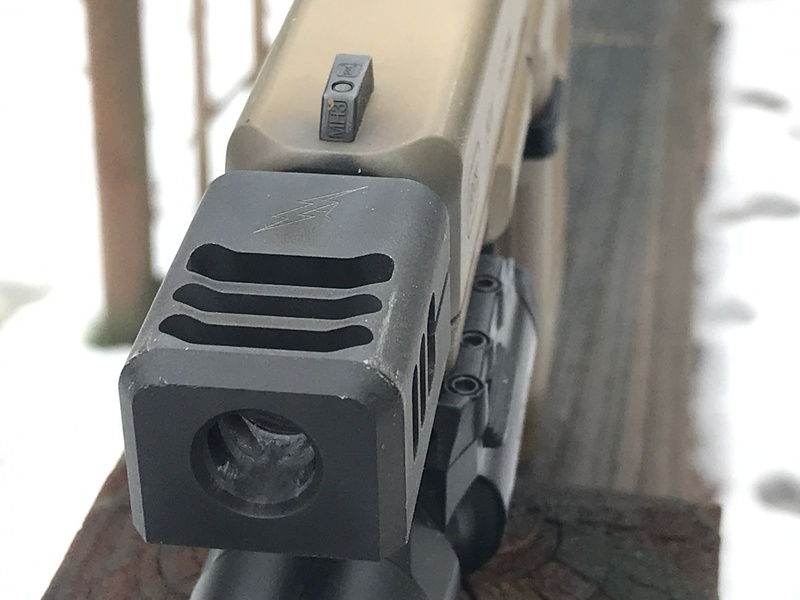 Elevation adjustments are made via a hex screw that puts tension on the top of the barrel and moves the main body of the rear sight assembly up and down. The windage adjustments are made by loosening the aperture and drifting it to the appropriate location. Once windage is set, the windage screw can be fully tightened to lock everything into place. 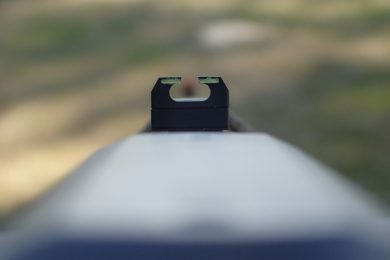 The front sight does not need to be drifted for adjustment. 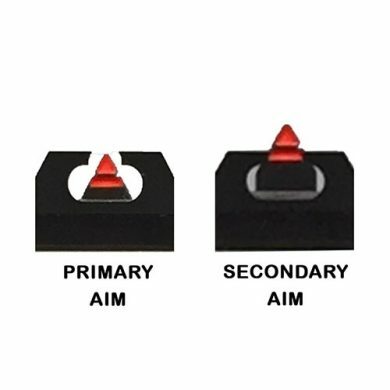 Once locked into place via hex-screw, there are two distinct quick aiming points one can use for quick shots at different ranges. Marlin 1894 sights are pretty easy to remove. 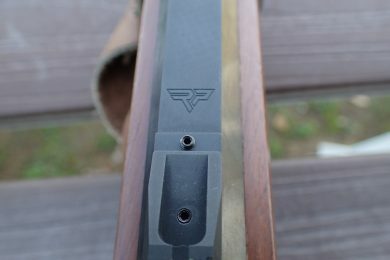 Once the rear sight elevator is removed, the rear sight can usually be drifted out right to left via finger pressure. The front sight assembly took a few hits with a brass punch to drift out. The new sights slid right into place and locked down easily with the hex screws. In direct sunlight, I found the two aiming points easy to use and the sights bright. It should be considered: if one anticipates frequent use in low-light or at night, there’s no substitute for putting on a red dot sight. 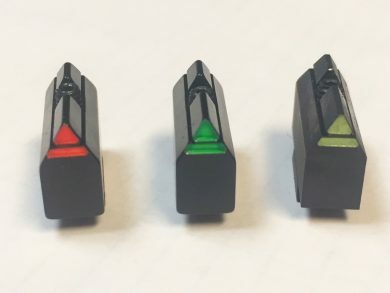 Something to note: These sights are CNC machined from 7075 aluminum and black anodized. They should therefore be rust-free. However, there is somewhat of a gap under the front and rear sight assembly above the barrel. The barrel underneath this gap should be cleaned and inspected for rust periodically. Check and clean these areas for rust immediately if one is using one’s rifle in humid or icy conditions frequently. The trigger on my early-00’s Marlin was just adequate. It was very floppy, had quite a bit of creep, and the re was a rough hitch before breaking at 6lbs. The flop of the trigger was also rattly and loud when trying to stalk in on wild boar in the rough lava rock country that I usually hunt them in. I’ve experienced Wild West Guns’ triggers before, as I have one of their Alaskan Co-Pilots in .45-70. 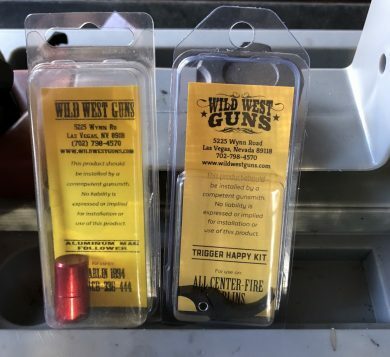 Knowing their triggers to be excellent, I ordered one of their “Trigger Happy Kits” (MSRP $100.00). This trigger is a precision CNC-machined 2-piece unit consisting of the trigger and sear held together with a hollow pin. The trigger can be had in either blued or stainless, depending on the look one is going for. While actually replacement of the trigger is easy, getting to the trigger assembly in one’s Marlin is a bit of a chore. There’s no quick way of getting at it, being that to do it properly, it requires removing the stock, bolt, and hammer assembly. Once done, one can remove the trigger and sear of the stock unit and install the new Trigger Happy Kit. This is also a good opportunity to do a detailed cleaning and oiling of one’s Marlin. Make sure to test proper safety, trigger, sear, and bolt function before finishing reassembly, as some later model Marlins may have troublesome interactions with the fit of the new sear, requiring minor fitting. Improvement was immediately apparent. The flop and rattle was gone, replaced by a trigger that broke consistently at 2.75lbs, lower than the average advertised 4lbs. Not only was the pull weight reduced by half, but the new precision made trigger has a very crisp, clean break. 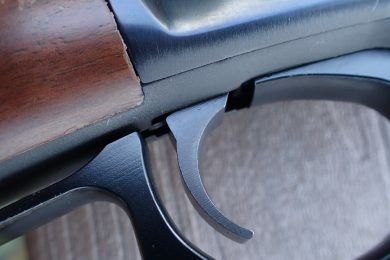 The original Marlin 1894s have magazine tube followers that are made out of Zytel. While they are ok, mine started to hang up in the tube and the edges on the back of the hollow follower started to degrade somewhat over time. 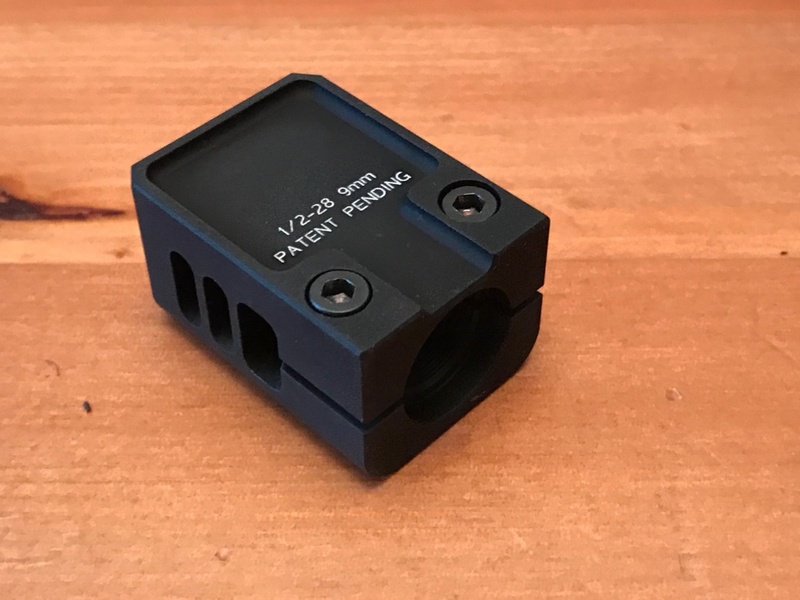 To alleviate this issue in the future, Wild West Guns’ CNC machined, anodized aluminum follower (MSRP $25.00) seemed like a good upgrade to add instead of replacing it with another Zytel or plastic follower. 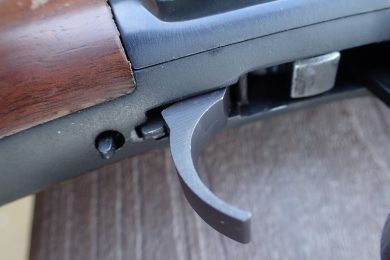 To install the new follower is pretty simple, just remove the end cap of one’s magazine tube, remove the magazine spring, and the old follower will drop out (if one has removed the appropriate magazine tube/barrel band screws depending on exact model). It’s also a good opportunity to clean and lightly lubricate one’s magazine tube assembly. 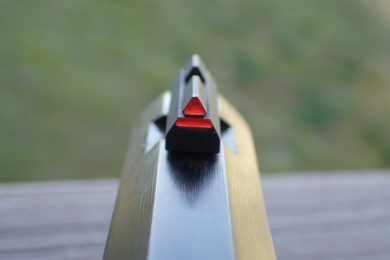 Testing after reassembly showed a definite improvement in loading the magazine tube and cycling flat point, hollow point, and Hornady Leverevolution polymer-tipped ammunition. Not only was loading the tube far smoother, it was also much quieter, eliminating the creak and squeak of the old follower. Upgraded with these three new improvements, I took my Marlin to the range to try things out. The much-improved trigger shone both in static shooting and for quickly ringing steel. There were no light strikes, malfunctions, or binding issues. The pull weight stayed consistent after live fire testing. The new follower kept the cartridges coming as fast as I could cycle the action, and loading the rifle was markedly easier than in the past. I had no issues with any kind of ammunition hanging up or cycling improperly. The new sights were nice, though the red on the front sight was somewhat hard to see under shade while shooting off the bench. I think that in the future, these sights could be aided by a triangular fiber optic insert at the top for more light collection. 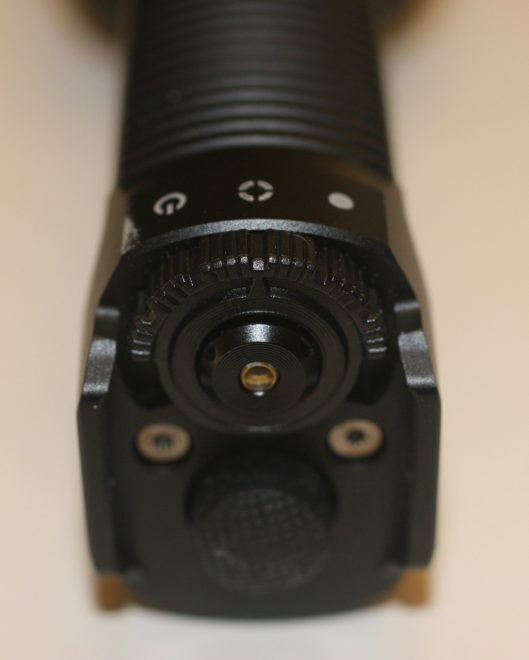 The sights were super simple to adjust, and stayed put once set. 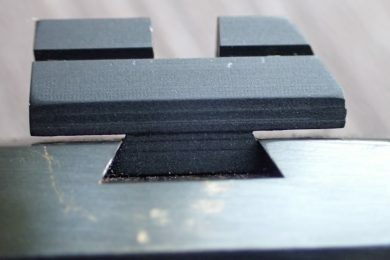 There is no separate screw to keep the adjustment in place, and that could be a good future improvement to make. They held up to more than 50 rounds of .44 Magnum without moving. To be sure they don’t budge while being rattled around in a side by side or saddle scabbard, some clear nail polish or preferred color of loctite should keep them in place. Overall, my shooting experience with this rifle was much improved. Loading and cycling were easier, and the groups tightened up at 50 and 100 yards with the new sights and much improved new trigger. My best group was .6″@50y, shot seated with the fore-end supported. The best group at 100y was 1.76″. I was not able to manage this kind of precision with the factory sights and trigger. Using the tip of the sight as my 50y zeroed aiming point and the line for my 100y point yielded an average POI at 100 1.5″ high of center with the American Eagle 240gr JSP load. The 2nd aiming point in my opinion is good for quick shots at these different ranges with the .44 magnum. Results will vary with different cartridges, barrel lengths and loads. As always, it’s best to test these things at the range before heading to the field. I look forward to continue using this Marlin with these enhancements as an excellent game-getter when hunting with friends and relatives in less permissive locales. Whether one has a nice old Marlin that needs some TLC, or a “Remlin” with some areas that could be improved, these all could be a positive enhancement. Sometimes it’s nice to update an old gun with some nicer features. Done right, it can greatly change one’s shooting experience for the better. As much as I love my silencers, I still end up wearing some sort of hearing protection when shooting. 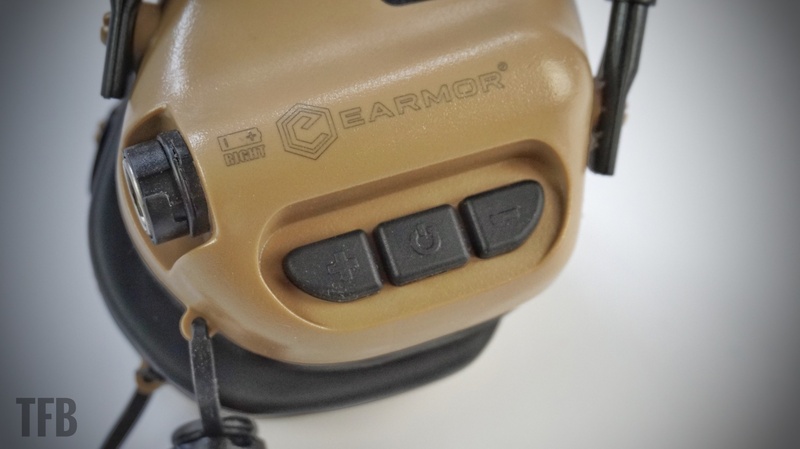 Without rehashing a topic we’ve discussed multiple times in the past, hearing-safe doesn’t always mean no hearing protection required. 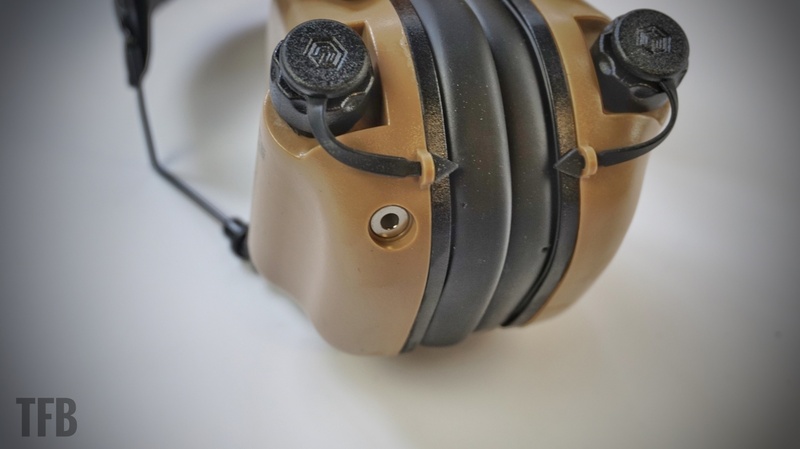 As a general rule, using subsonic ammo in many hosts can mean dropping the muffs or plugs. Supersonic ammo, on the other hand almost always requires additional protection – much like a trip to Bangkok in the 80’s. 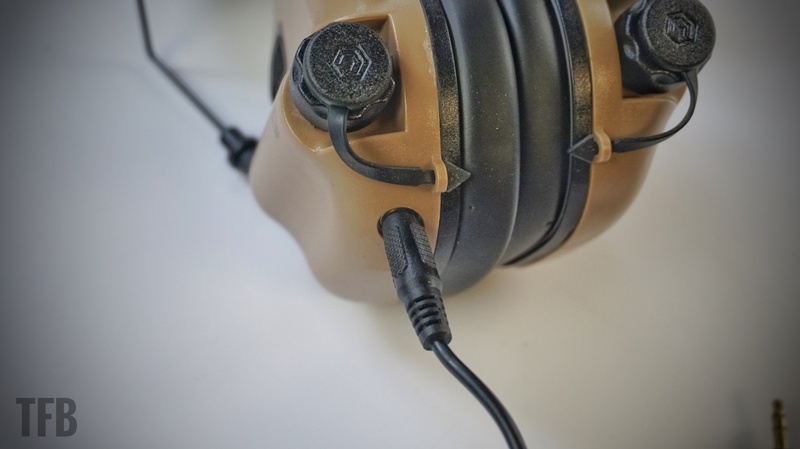 Today, we will take a look at the M31 EARMOR electronic hearing protection from OPSMEN. The debate over ‘plugs vs muffs’ has been around for years. 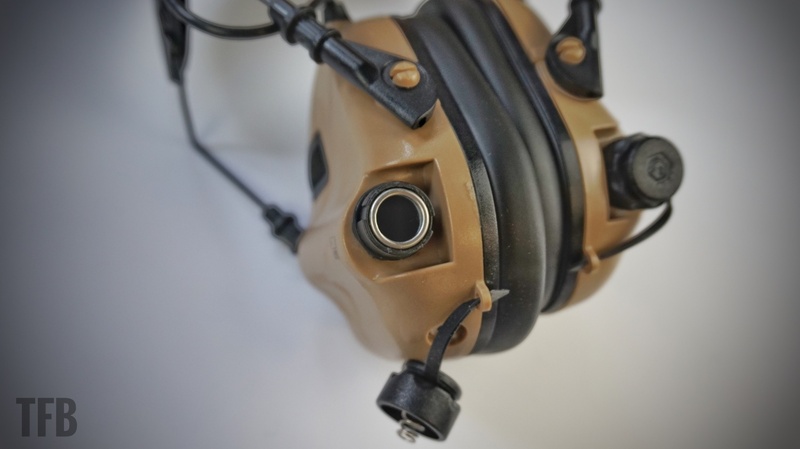 And while some research shows that earplugs can be more effective than muffs in reducing damaging noises, combining the two gives you the benefit of an added safety net during training. 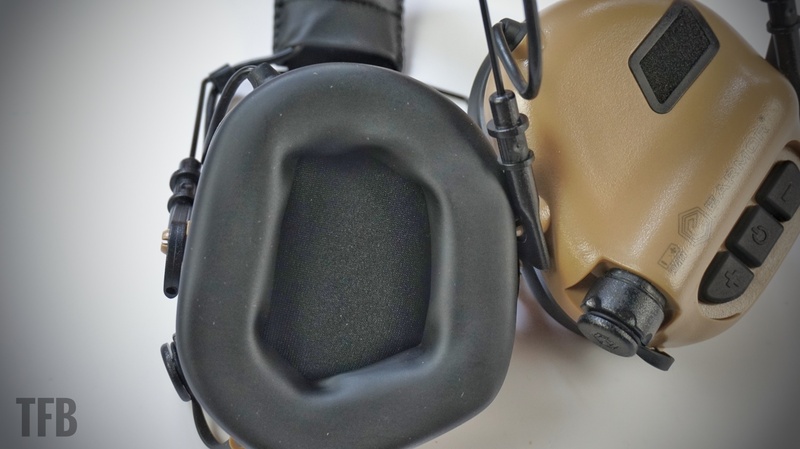 Most electronic hearing protection I have experience with can be used in conjunction with foam or silicone earplugs. 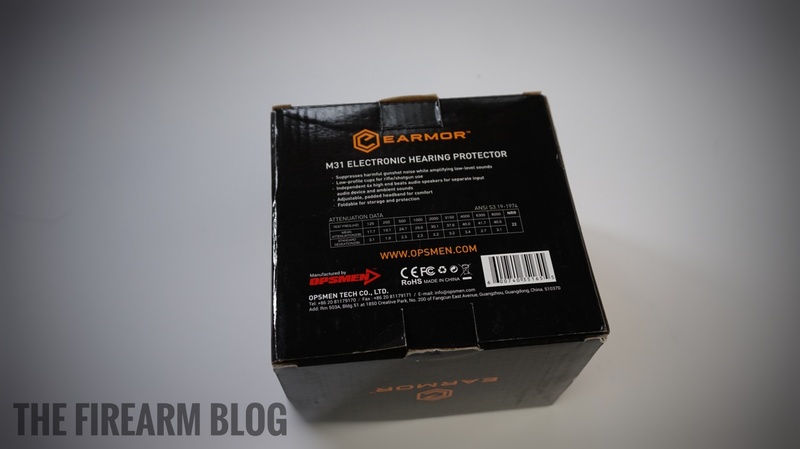 The OPSMEN M31 EARMOR comes neatly packaged in a cardboard retail box. My unit came shipped directly from its country of origin: China. Some buyers may take issue with Chinese-made products, however, keep in mind the iPhone or Android device that is likely in your hand or pocket was made and assembled in the same country. 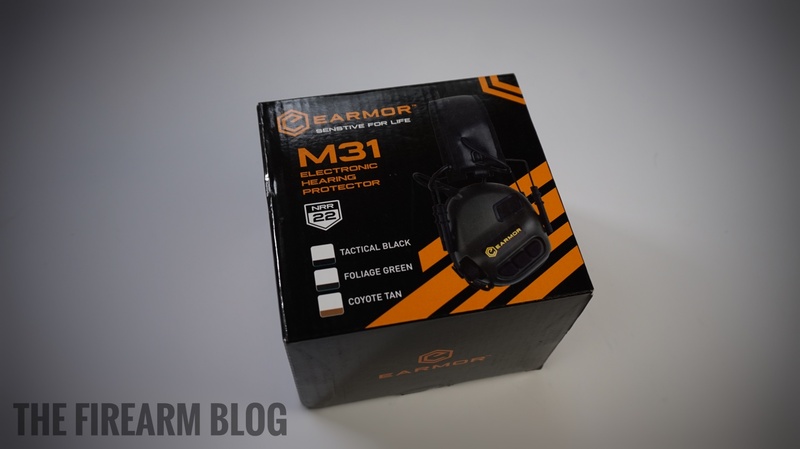 The M31 is made from think polycarbonate plastics and seems generally well made. My test unit had a small spot of glue left from the manufacturing process attached to the outside of the shell. It wiped away cleanly with just the pad of my thumb. The controls on the M31 are intuitive and large enough for manipulation with gloved hands. The middle button is power on/off, the forward button decreases the amplification and the rear button increases amplification. Pushing the buttons results in an audible beep in the headset, which I thought was a nice touch at this price point. The battery compartments open with a quarter turn counterclockwise; the unit uses two AAA batteries. 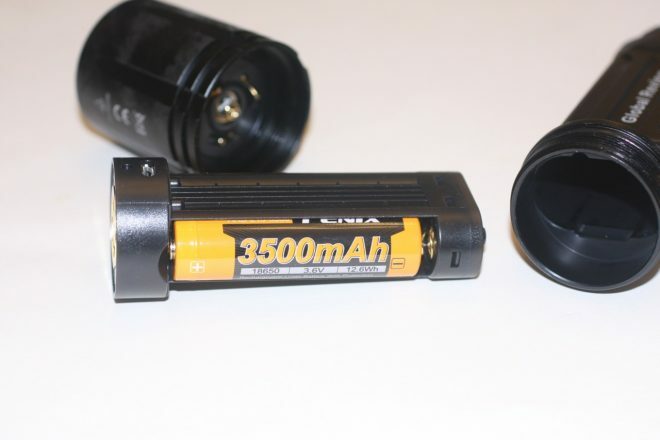 It is recommended that the batteries be removed when the unit is not in use which is common with devices like night vision and optics where the risk of damage due to corrosive batteries exists. The battery port doors and the retention straps seem a little light for being an integral part of the unit. But a few months of range time will determine its overall durability – I’ll keep you posted. The head strap is pushed on to the muffs and held by friction nubs (Friction Nubs is a registered trademark of Pete @ TFB) which could be a failure point, but the overall construction of the M31 is stout, so I’m not sure that I am concerned. Again, hopefully, I’ll be able to come back at the end of spring with a longer-term review. After the batteries are installed, everything else is pretty straightforward: press the ‘+’ button to increase amplification; press the ‘-‘ to decrease amplification. The power button turns the unit on and off. OPSMEN has included an aux-in jack and cable allowing for the addition of outside audio sources. There is no dedicated mic, however, so if you are planning on narrating your 3-Gun match on Snapchat look elsewhere. 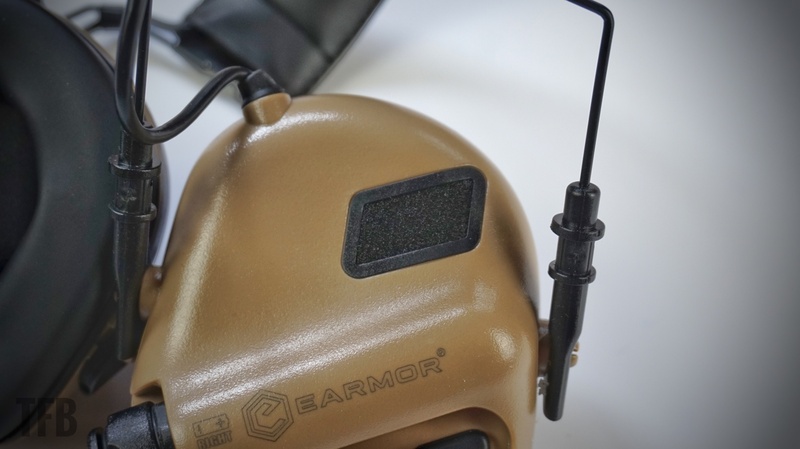 OPSMEN does have another model that incorporates a headset mic if you need radio comms. The foam insert is comfortable as is the rings that fit around the ear self. 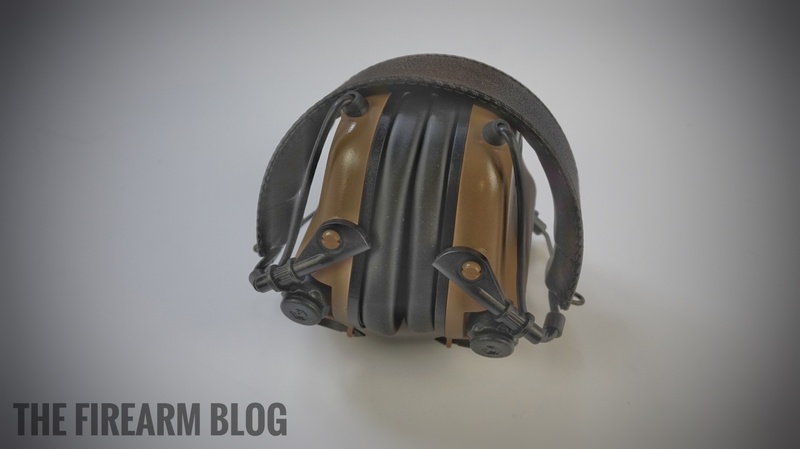 The head strap form-fits to the head and I didn’t sense any impeding fatigue. Besides shooting, I used the M31’s while using standard garage power tools without issue. The M31 touts “360-degree” hearing amplification and voice isolation. Without sensitive measurement devices, I’m not sure how to quantify its performance. 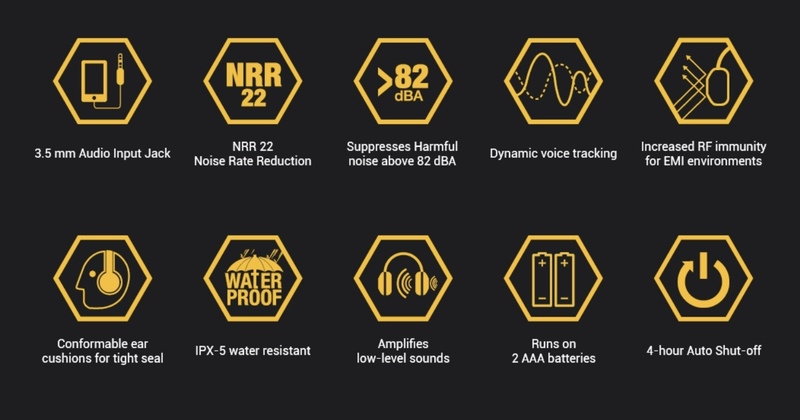 I did feel that the amplification was more than adequate on normal levels with some background noise.in my opinion, this unit on par with other electronic hearing protection I have owned that costs twice as much as the M31 EARMOR. 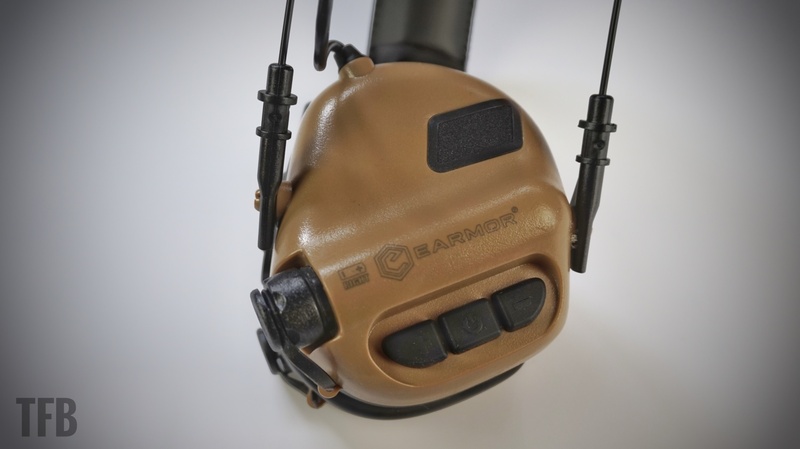 Although I have only fielded the OPSMEN M31 EARMOR for a few weeks, I will be following up with a longer-term review as the shooting season progresses. Right now, I feel that the M31 is a low-risk, high reward investment – for $40 you really can’t go wrong if it continues to perform at a level that my test unit has displayed. Additional details, specifications, links, and pricing can be found below. Order on Amazon here – affiliate link to support TFB.